Zero Nicotine Review - Does Zero Nicotine Work to Help Stop Smoking? The Zero Nicotine product is a transdermal patch which contains herbal ingredients that mimic some of the properties of nicotine. This formula addresses nicotine addiction and the symptoms of withdrawal from nicotine without introducing any nicotine into the body; the herbal formula helps to gradually decrease the desire to smoke while minimizing the effects of nicotine withdrawal, which can include irritability, headaches, gastrointestinal upsets, and insomnia. In addition to the ingredients that help manage the issues with nicotine, the Zero Nicotine patch contains many ingredients designed to detoxify the body and to promote optimal functioning of the circulatory, digestive, respiratory, and immune systems. The Zero Nicotine patch is placed on the skin and worn continuously for three days, after which time the patch is removed and thrown away. A new patch is then placed on a different skin site for the next three days. The transdermal method used in the Zero Nicotine patch ensures fast absorption and a steady delivery into the bloodstream, reducing the ups and downs commonly found with oral medications. Gotu Kola, known for its properties in promoting relaxation and improving concentration. Hops, helpful in the reduction of cravings and stressful feelings. Skullcap, which promotes relaxation of the nervous system and treats insomnia, anxiety, and headaches. Oat, which helps to resolve problems with the nervous system and depression; also strengthens the immune system. Peppermint, a purifying herb that is beneficial in improving the circulatory and respiratory systems. Ginger Root, known for its properties as a digestive aid. Gentian, which promotes the healthy functioning of the circulatory system and aids in digestion. Myrrh, helpful in relieving coughs and other respiratory ailments. Safflower, known for its properties as a digestive restorative and for stimulating the immune system. Eucalyptus, an excellent ingredient for promoting healthy respiratory functioning. Slippery Elm, which boosts the immune system, detoxifies the body, and helps to soothe coughs. Licorice Root, helpful as a cough reliever and also as a detoxifier; also helps to relive fatigue and depression. Alfalfa, which promotes healthy circulatory system functioning as well as relieving respiratory disorders. Passion Flower, helpful in treating anxiety and relaxing the nervous system. Sarsaparilla, a potent detoxifier that also increases energy levels and promotes circulatory system health. Bayberry, which helps in treating sore throats and coughs, as well as increasing healthy circulation. Echinacea Powder, helpful in promoting immune system functioning and combating colds and illnesses. 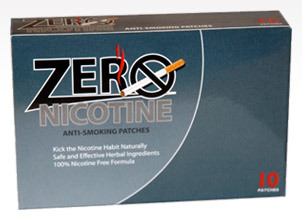 The Zero Nicotine patch is available for purchase through the company's website, toll-free number, fax, or mail, and can also be purchased through affiliate websites. For a box of 10 patches (a one month supply), the price ranges from $42 to $59.95 depending on the website, so it pays to shop around a bit. Quantity discounts are also available; for instance, a 6-month supply (60 patches total) is $239.95. Shipping and handling is $9.95 for smaller orders, and larger orders feature free shipping. The company offers a generous 100-day money back guarantee; upon return of the unused portion of the order, they issue a full refund for the original purchase price, less shipping and handling. The customer testimonials for Zero Nicotine patches are, for the most part, positive. A number of users were able to completely stop smoking using Zero Nicotine in place of cigarettes and other smoking cessation aids. The company offers a toll-free number whereby customers can call and record their testimonial; if the testimonial message is used on Zero Nicotine's website, the customer receives a free 6-month supply of the product. We fear that this offer may have inflated the number of positive testimonials. Some users had rashes and irritation at the patch site, so the product may not be a good choice for those with sensitive skin. There were some users who were not able to quit their smoking habit with the use of Zero Nicotine; some of them commented that they did not feel the product addresses their nicotine cravings. We found some evidence of consumer complaints about Zero Nicotine's free trial offer that wasn't really a free trial; customers who had signed up for this option were instead shipped a full month's order and billed accordingly. It seems that the company has eliminated the free trial offer, and instead offers a money-back guarantee.